Welcome to the PDF-Marker home page. PDF-Marker is a tool to apply 'stamps' - text and images - to PDF files and allow to update/change or remove these markings later (permanent markings that could not be changed are also possible). 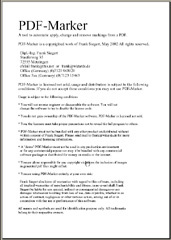 PDF-Marker was written by Frank Siegert who also develops the PStill PDF converter system. PDF-Marker is also available as Win32 DLL for adding PDF 'stamping' to your own applications, versions for MacOS X, Linux, Sun Solaris, HP UX, SGI IRIX, IBM AIX and FreeBSD on request. While PDF-Marker is made for speed and allows for change/removeable markings, PStill also can impose markings on PDF pages using its Scripting Interface, also very complex ones. Please a take a look at this PStill tutorial on how to apply a stamp. Markings can be underlaying or toplaying, contain multiple lines of text and an image (including transparent parts) per document. Markings can be defined by a script that can also be included into the PDF result and later retrieved. This way even the marking definitions that make up the 'stamp' can be transported and changed/added to later. PDF-Marker can update any markings it has applied to a PDF, thus allows for status changes of the documents later. 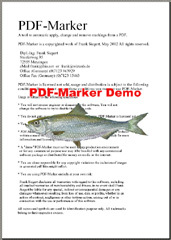 PDF-Marker can remove any markings it has applied to a PDF, thus revealing the original. PDF-Marker is currently available for Windows (98,ME,NT,2k and XP), Solaris and Linux as command line program. As such it can be easily included or called by other programs or scripts. The system was written for speed and compatibility. While conversion speed depends on the input and the system PDF-Marker runs on, in most cases applying or changing a mark does not take more than a few seconds. 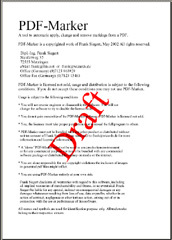 Like PStill PDF-marker is a stand-alone program and does not need any other applications installed. Where can I get the program? For MacOSX Stone Design offers StampInStone, a GUI version of PDF-Marker. Please visit their site for more information. For a demo version for any other operating system please send me an email including you contact information (Which is not used for any other purpose). Please allow a few days processing time, usually you can get an answer within 24 hours. Can I order the program online? Do you have other needs or questions? I also offer tools for fast raster image to PDF conversion, PostScript/EPS to PDF conversion, complete EPS/PS Preflight systems, PostScript Separation, Color Control and Job Proofing and most RasterImage/PS/EPS/PDF related conversion solutions you can think of. My programs are in daily use in several newpaper and publishing houses worldwide. Please contact me for more information. My full contact information can be found here. ALL NAMES AND SYMBOLS ARE USED FOR IDENTIFICATION PURPOSE ONLY. PSTILL IS A REGISTERED WORDMARK OF FRANK SIEGERT. POSTSCRIPT, ADOBE, ACROBAT, DISTILLER, PDF AND OTHERS NOT MENTIONED HERE ARE TRADEMARKS OR REGISTERED TRADEMARKS OF ADOBE SYSTEMS INCORPORATED. SUN, SPARC, SOLARIS AND OTHERS ARE TRADEMARKS OR REGISTERED TRADEMARKS OF SUN INC. HP, HPUX AND OTHERS ARE TRADEMARKS OR REGISTERED TRADEMARKS OF HEWLETT PACKARD INC. AIX IS A REGISTERED TRADEMARK OF IBM INC. ALL OTHER BRAND OR PRODUCT NAMES MENTIONED ON THIS PAGE, IN THE IDENTIFICATION PRINT OUT OF THE SOFTWARE OR ITS DOCUMENTATION ARE THE TRADEMARKS OR REGISTERED TRADEMARKS OF THEIR RESPECTIVE HOLDERS. PDF AND PDF LIST OF OPERATORS AND DATA STRUCTURES ARE COPYRIGHT ADOBE SYSTEMS INCORPORATED. PDFMARKER WAS WRITTEN ACCORDING TO THE COPYRIGHT STATEMENT AS OUTLINED IN THE ADOBE PORTABLE DOCUMENT FORMAT REFERENCE MANUAL VERSION 1.2, PAGE 22/23. THIS WEB PAGE CONTAINS LINK TO THIRD PARTY WEB SITES WHICH ARE NOT UNDER CONTROL OF FRANK SIEGERT. THESE LINKS ARE ONLY PROVIDED FOR CONVENIENCE AND THE INCLUSION OF THESE LINKS DOES NOT IMPLY ANY RESPONSIBILITY FOR THE CONTENTS ON THESE SITES. THIS WEBPAGE IS LOCATED IN GERMANY. NO FURRY LITTLE ANIMALS WERE HARMED IN THE PRODUCTION OF PDFMARKER.